Hi ladies! Happy Wednesday! So I might have just had the realization that Thanksgiving was next week (where did the time go?!) and was thrown into a bit of a panic. The one thing each year that I always seem to be too late with is Christmas pajamas! I figured what better way to kick off my holiday gift guides than with the items that always seem to sell out the fastest, and for the last few years, it’s definitely been these types of cozy holiday essentials! Nothing better in my book than cozying up on the couch on a cold night with Home Alone (or Krampus…if you haven’t seen that movie definitely watch it this season. It’s a Christmas horror story, but it’s hilarious! Especially after a few glasses of vino), in my PJs! If you’re looking for pieces that you can wear out and home, try this pink sweatshirt or this red one. Wildfox has some of my favorite comfortable basics, and each year they come out with the cheekiest holiday pieces! 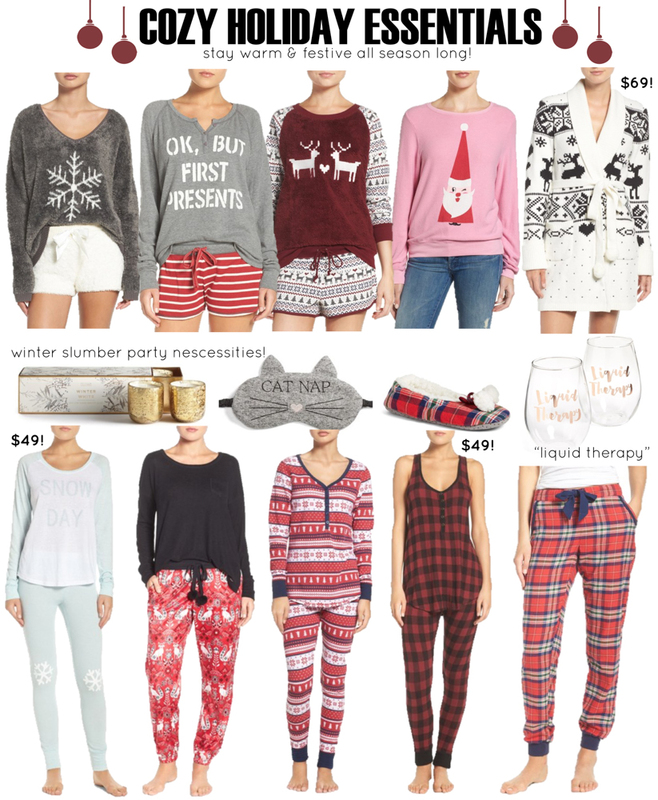 What’s your take on holiday pajamas? Do you buy yours early and wear them all season long? Or do you save them until Christmas Eve?! I just bought the red snowflake ones in the bottom center and can’t wait for them to arrive! So festive!! I LOOVE christmas jammies! I saw the cutest fuzzy sock/boot things on altar’d state’s website the other day! I love pajamas, especially of the holiday variety! I could just live in them. Such cute options in your post! Love it!